Kenya Natural History Guide >>> Insects >>> Wasps, Bees and Ants - Hymenoptera >>> Tachysphex ? At Maanzoni, Machakos, Kenya, 30 May 2017. 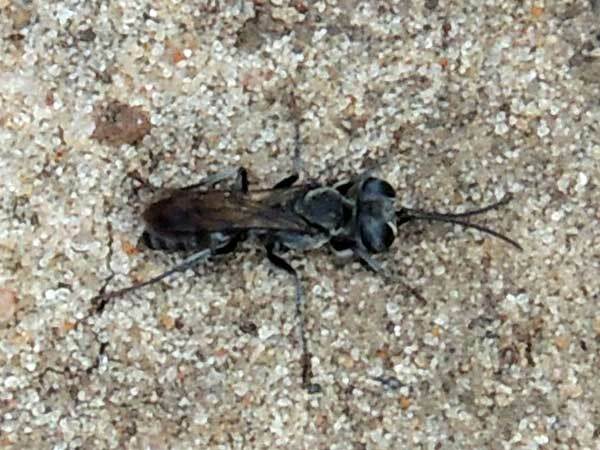 With a flattened profile and big eyes for improved vision under low light conditions this wasp is designed around hunting for cockroaches that often hide by day within dark, narrow crevices. Once paralyzed the roaches will be used to provision the wasps young larvae in their own nest tunnel. Copyright Michael J. Plagens. Page created 3 Oct. 2017.